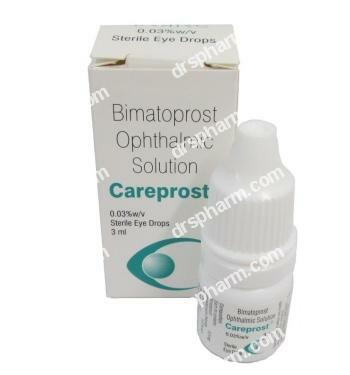 Careprost eye drops is a drug commonly used to lower the intra ocular pressure in patients with glaucoma. High intra ocular pressure is caused by a build up of fluid in the eye, and can damage the optic nerve which can lead in time to blindness. Careprost eye drops will mediate the lowering of the intra ocular pressure by facilitating the excretion of the fluid that has built up inside the eye. The fluid is called aqueous humour and is secreted and also excreted by our eyes constantly. When the excretion process becomes slow, Careprost eye drops aids. Careprost eyedrops work because they contain bimatoprost, an analogue of a prostglandin like chemical that has, including others, the caracteristic of lowering the intra ocular pressure by aiding the drainage of the aqueous humour. Thus, the intra oculare pressure is normalized and the risk of optic nerve damage is reduced dramatically. Careprost eye drops 0.03% should be applied daily in the affected eye, following the instructions provided by your physician or pharmacist. Wearing contact lenses interferes with the effects of Careprost eye drops 0.03%. Before applying Careprost eye drops, you should remove your contact lenses, and after the drops have had their effect (usula fifteen minutes), you should replace them. There is no specific span of time in which you should use Careprost eye drops, each patient has different response to the treatment and you should follow your doctor’s orders. This means that you may be required to use the drops for several months or even years. The goal of using Careprost eye drops is lowering intra oculare pressure, but this will not cure glaucoma. Because Careprost eye drops may cause your vision to get blurry, it is highly recommended that you stop all activities that may put your life in danger. Do not operate heavy machinery, do not drive. For fifteen minutes after using Careprost eye drops, rest. The most commonly reported side effects when using Careprost eye drops 0.03% include: red congested eyes (conjunctival hyperaemia), itching, irritation or inflammation of the eye (conjunctivitis) and eyelid (blepharitis), sensitivity to light, an increase in colouring or pigment of area around eye, visual changes, eyelash darkening, darkening of the iris, headache, dizziness. If you are experiencing any of these side effects on a daily basis, report them to your doctor immediately. If the patient is using other drugs, whether they are prescribed by a doctor or bought over the counter, the combination of drugs may lead to Careprost eye drops not working properly. If you are using other types of eye drops, consult your doctor and tell him the names of the drugs that you are using before starting to use Careprost eye drops. If you happen to miss a dose of Careprost eye drops, take it as soon as you remember, as long as it is not already time to take the next dose. Do not use double dosage to make up for the missed one. There are no such serious effects of overdose. On conditions that overdose is suspected the sufferer must seek a doctor’s advice. Careprost eye drops should be stored in a cool place, without moisture, where the temperature is below 25 Celsius. Four weeks after you have opened the Careprost eye drops bottle, you should discard it. Keep the bottle away from children.